What's Behind the Syrian Chemical-Weapons Warning? Picking up where the White House left off, shortly after the statement's release U.S. ambassador to the UN Nikki Haley tweeted: "Any further attacks done to the people of Syria will be blamed on Assad, but also on Russia & Iran who support him killing his own people." She is known to have a more forward-leaning position on foreign-policy issues, especially when compared to the State Department. Nevertheless, she was added to the Principals Committee that deals with the national-security issues after the last known Syrian chemical-weapons attack in Khan Sheikhoun in April. Earlier on Monday she tweeted, "Great meeting and lunch with @POTUS and @VP today #USStrong" referring to the president and Vice President Mike Pence. Accompanying that sentiment was a picture of herself sitting across from President Trump in the Oval Office. Lunch wasn't the president's only foreign-policy related dining experience of the day either. The White House hosted a dinner for the visiting Indian prime minister Narendra Modi, which was attended by Secretary of Defense James Mattis, Secretary of State Rex Tillerson and National Security Advisor H. R. McMaster. Secretary Mattis departed for Germany and Belgium later in the evening and Joint Chiefs of Staff Chairman Joseph Dunford was in Afghanistan at the time. According to an Associated Press report, a nongovernmental source with close ties to the White House said the administration had "received intelligence that the Syrians were mixing precursor chemicals for a possible sarin-gas attack in either the east or south of the country, where government troops and allied forces have faced recent setbacks." The United States was watching Assad's Shayrat Airbase. After the regime's air-strike attack on Khan Sheikhoun in April, senior administration officials told reporters in a White House background briefing that they had "quite clear" information that a SU-22 fixed-wing aircraft from the regime-controlled Shayrat airfield carried out the attack. The airfield was also the recipient of President Trump's Tomahawk missile response. As one would expect, the latest White House message on Syria reverberated internationally. Ali Haidar, who holds the cynically contemptuous title of "Syrian Minister for National Reconciliation" dismissed the statement and suggested, "the charges foreshadowed a new diplomatic campaign against Syria at the UN." The Kremlin wasn't far behind. Russian president Vladimir Putin's spokesman Dmitry Peskov said, "such threats to Syria's legitimate leaders are unacceptable." Going further, Peskov took issue with the Trump administration's use of the phrase "another chemical weapons attack" because it implies there was, in fact, a previous chemical-weapons attack. He contended that Moscow called for an independent investigation into the April attack but one was never conducted. Absent from much of the frenzied reporting on the late night warning is the context of the evolving war in Syria. The natural questions have already been asked: Why would Assad use chemical weapons again? What intelligence did the United States have that led to the White House warning? What does "a heavy price" mean as far as a response is concerned? Is there a metric already worked out by the White House that calibrates American responses to specific actions from Assad? And so on. "Everybody wants to know what we're going to do and what the threshold is," a senior White House official with knowledge of national-security matters told this author on Tuesday, "but that's not something we do. We don't give our playbook away." The senior official continued: "The strategic objective is to stop the carnage in Syria and our target specifically is ISIS." When asked about the escalating developments in Syria's east and south, he reiterated, "The Islamic State is the military target of our forces," then he added, "But that doesn't mean we don't understand the broader geostrategic reality and the interplay of all the other actors involved in the theater." The center of the conflict for pro-regime forces has shifted from the west, eastward towards the territory that ISIS holds as they battle U.S.-backed forces. It brings Team Assad into direct conflict with the United States and raises the risk to U.S. service members on the ground. Assad and his Iranian patrons may understand the balance of power in the wider region may well be determined in Syria's east. As ISIS dwindles, the other major powers and patrons involved in the Syrian cauldron are redeploying their forces as they vie for political, economic or military influence over Syria's future. General Map of Syria and territory held as of June 17, 2017. Red = Assad Regime & Allied Forces; Green = Syrian Opposition (U.S.-backed forces in the south); Yellow = Kurdish & SDF (U.S.-backed forces in northeast); Grey = ISIS. Despite Russia's air support since 2015 and the heavy lifting carried out by Iran and its proxies on the ground since 2013, the Alawi Syrian dictator and his two chief allies have proven unable to capture and hold territory while simultaneously advancing along a second battlefront. Their efforts have mainly focused on western Syria where the larger cities and Alawi population centers are located, with an additional emphasis on the northwestern coastal strip considered vital to the three stakeholders. The eastern territory that ISIS holds is less populated and hasn't been as high on Assad's to-do list when compared to the immediate challenges posed by the other Sunni Salafi rebel groups or elements of the Free Syrian Army closer to Assad's center of power. 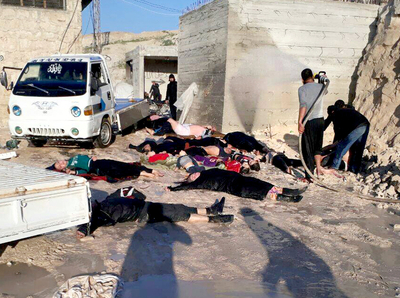 It brings into focus Assad's strategic choice to use sarin gas in Khan Sheikhoun on April 4. That was also directed at the rebels and civilians in the Idlib Province and was also close to where Russia has its naval and air base, and forward listening post. Within hours of the strike, Assad and his partners cynically followed up by bombing the medical clinics where the first victims of the attack were being treated. The strategy also reflected the extent to which he first wanted to pacify the Idlib Province before he and his partners turned their attention toward reconquering the rest of Syria. 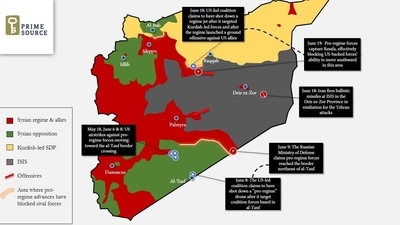 Additionally, it highlights Team Assad's inability to quickly pacify the area using conventional weapons, despite the considerable assets Iran and Russia have devoted to that cause. 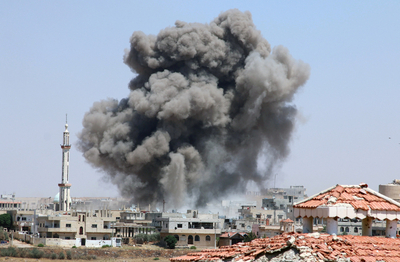 Another chemical-weapons attack in Idlib Province could dissuade further rebel advances. If the target wasn't meant for the northwest, it would likely be one of the three strategic arteries Iran needs to complete its land bridge from Tehran to the Mediterranean Sea because Assad is dependent on Iranian-backed forces on the ground. Of the three, Deir al-Zour would top the list. To reach Deir al-Zour, one would want to take the Abu Kamal-Qa'im border crossing. The corridor runs to the southeast of Raqqa and the province remains largely in the hands of the Islamic State. It was also the target of Iran's recent launch of ballistic missiles. Assad's forces are advancing in that direction from Palmyra to the south and from Aleppo to the north. Meanwhile, Iran plans to have the Hashd al-Shaabi or its Popular Mobilization Units—a group of Shia militias that are, ostensibly, part of the Iraqi government's security forces—take the eastern border zones while using its forces deployed in Syria to push from the west. To that end, one of the Iraqi Shia militias under Iran's stewardship announced their recent deployment to the border crossing and southeast Syria. Iraqi militias backed by Iran already took the border town of Al-Ba'aj from ISIS and told The Guardian that they are exploring possible paths to create a supply line to Deir al-Zour that could bypass the Abu Kamal-Qa'im crossing. It is less likely that Assad would use chemical weapons on Raqqa. That warzone is on the Euphrates River where the U.S.-backed Syrian Democratic Forces are currently engaged with ISIS. It also is a few miles from where the United States recently downed the Syrian SU-22 fighter jet and where independent reports indicate the United States is building a fifth forward operating military base near Tabqah. A chemical-weapons attack in the south is also not as likely—even if the area is the most strategic of the three. The main highway connecting Baghdad to Damascus runs through the southeast along Syria's border with Jordan and Iraq. It also happens to be where the United States and allied forces set up shop with a military outpost just over a year ago. The Al-Tanf border crossing is also a deconfliction area that recently became a flashpoint, prompting the United States to down several Iranian drones in the past few weeks. With U.S.-aligned forces increasingly under attack, the U.S. military has moved a High Mobility Artillery Rocket System into the area from Jordan to dissuade Iranian-backed militias from targeting American troops. A chemical-weapons attack near either Tanf or Raqqa would risk killing U.S. soldiers or those of other important U.S. allies. In such a scenario, one could envision fire and brimstone representing President Trump's definition of "a heavy price" in response. Therefore, for strategic reasons that also bump up against what is rationally possible for the regime, the most likely targets Assad would consider are Idlib and Deir al-Zour. There are additional points worth noting based on recent events. The fact that recent reporting describes the Syrians mixing precursor chemicals at the Shayrat airfield indicates that those stockpiles have probably not been moved since April. That is noteworthy because in the wake of Trump's retaliatory Tomahawk strike, Assad reportedly moved many of his aircraft to the airbase at Bassel al-Assad International Airport. Nearby is Russia's sizable Khmeimim Air Base in Latakia close to its other expanding land and sea assets. This could indicate that Russia has no desire to either host Assad's chemical weapons or have them at a Syrian base close by. In other words, there's a limit to how far in street Putin is willing to let Assad play. Russia and the United States likely do not want a much larger military conflict between themselves, least of all over Syria. This points to the reality that it is quite likely the two will need to negotiate and agree on some form of settlement to the Syria conflict at some point down the road. The question remains what will be their red lines? Here, the Trump administration appears to understand something the Obama administration forgot, namely, that it helps to have a strong military position on the ground when negotiating at the table. Another important lesson is that the pro-regime escalations at all three strategic locations in the south and east are not isolated incidents but the opening salvo in the next phase of the Syrian conflict. In this round, Iran will play a deeper role and a widening of the conflict is inevitable. That comports with reality because whether or not the White House publicly admits it, the answer to the war in Syria evolved long ago beyond the question of the Islamic State and the future of Bashar al-Assad. Increasingly, it is becoming about Iran. Despite the official public statements regarding the single-minded United States focus on ISIS in Syria, the conversation I had Tuesday with a senior White House official left little room for doubt that the United States was more than prepared and has considered such a contingency. "Think of it as strategic communications. 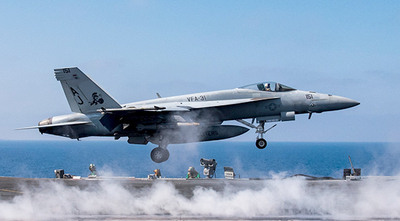 The cruise-missile strike wasn't just a kinetic slap on the wrist. It was a clear message that under the Trump administration, red lines mean something." The impression I received is that Tehran should take notice.